Cost is high but you are getting a decent effect and good icons + skill. Ability is nice if you can pull it off, all other Gugs are decent enough forces that getting the effect will make a difference. Trouble is that manufacturing a scenario in which PD is wounded is harder to achieve. Khopesh seems the most obvious one (actually, a Gug heavy deck with Khopesh as restricted is tempting...). But bounce/sacrifice/destroy effect ruin this guys day. There are exactly 6 Gugs, and most of them are things you wouldn't want to hardcast. This guy is the way around that, and I can see Khopesh being the enabler. 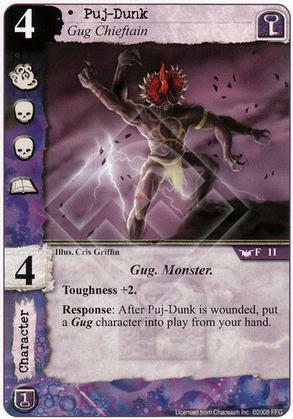 Unfortunately, most of the effects of the other Gugs aren't particularly exciting (Laboring and Enraged Gugs are fine, but not great on their own). If more Gugs are printed in the future, this guy gets better by default. The 4 cost is still keeping him down, though, because it's difficult to get his ability to trigger when you want it to, and it's hard to justify 4-drops that don't immediately affect the gamestate. I wish there were more gugs in this game, it's a very interesting subtype that is woefully unsupported. This guy is the best way to cheat gugs into play but due to the limited number of characters he can work with he will rarely see play.